The forced return to North Africa of immigrants in the Mediterranean, such as the one on Monday, violates international law, but all indications are that it will continue to be. An Italian ship, which returned a few hundred immigrants to Libya on Monday after rescuing them in the Mediterranean, has once again stoked the war on International Law. The massive return, operated by a ship of the Italian company Augusta Offshore of Naples – the first case since the formation of the new Government of the country -, was branded as a “flagrant violation” of international legislation by NGOs and jurists. They argue that migrants, already rescued by the ship, have been prevented from exercising their right to ask for political asylum and have returned them to a country submerged in political instability and bloody conflicts and that they have not signed important agreements on rights. Humans. An argument that the Italian Government led by the xenophobic League and the Five Star Movement (M5S) has rejected, arguing that the coordination of the rescue operation would not have been operated by Italy. The complex case, which has once again manifested the political juggling policy of the Italian Government against its international migration, refers to the case of the Asso 28 vessel belonging to the Mellita Oil & Gas, a joint company of the Italian oil company ENI and its Libyan counterpart, the National Oil Corporation (NOC). This ship was in the waters adjacent to its oil platform when, on Monday afternoon, it came to the rescue of the immigrants who were then transported by the Asso 28 to the port of Tripoli, in Libya, according to the reconstruction carried out by the owners of the ship and the NGOs. And that, less than a month ago, on July 2, the community spokesperson for the Interior, Natasha Bertaud, saw this as impossible. “There will never be repatriations to Libya from European ships.” Said, at that time, Bertaud. Even more, given that Italy had already been condemned for a similar behaviour in 2012. That year, in fact, the European Court of Human Rights condemned Rome for violating human rights principles by rejecting migrants and African asylum seekers on the high seas (the case known as Hirsi Jamaa and Others vs. Italy). The reason: having infringed, with the return to Libya of these persons, several articles of the Convention for the Protection of Human Rights and Fundamental Freedoms (1950), including article 3 (Prohibition of torture or inhuman treatment) and Article 4 of Protocol Number 4 (Prohibition of collective expulsions of foreigners). The ruling, however, also stated that, in that case, the plaintiffs were “under the jurisdiction of Italy”, something that apparently served the Italian Government to focus the debate on the presumption that the authorities of this country would not have been. in coordinating the rescue. “The rescue operations were carried out under the coordination of the Libyan Coast Guard who managed the entire operation,” the Italian Coast Guard said. This body “has not coordinated or participated in any of these operations, as a foreign NGO has falsely declared,” said Matteo Salvini, the controversial interior minister and head of the xenophobic League. A missile directly aimed at the NGO Proactive Open Arms and the crew aboard that ship, which had previously stated that there was evidence of radio communications in which Asso 28 reported having received instructions from the Italian oil company ENI. “That’s what they told us from the Asso 28. 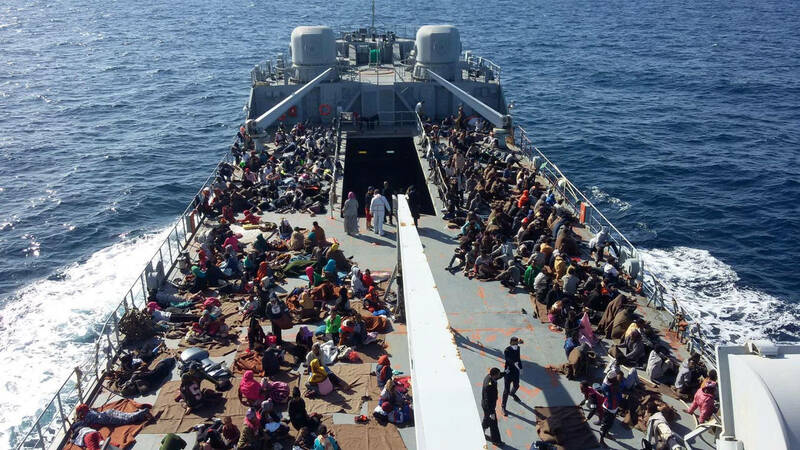 Besides that, there’s an undoubted fact that this ship has an Italian flag,” affirmed The Confidential Nicola Frantoianni, parliamentarian of the Italian Left and Freedom party who, these days, is on the high you are in a rescue mission of the Spanish humanitarian organization. Trump, happy “We have entered a gray field,” commented, on the other hand, the expert lawyer in Human Rights, Fulvio Vassallo Paleologo. The lawyer referred to the area of Search and Rescue (SAR), recently declared by Libya, but about which there are no legal certainties due to the absence of a politically stable State that watches over it. The controversy coincided with the third meeting between US President Donald Trump and Italian Prime Minister Giuseppe Conte, in which the American praised Italy’s work on the migration front. “I very much agree with what they are doing with respect to immigration and illegal immigration, and even legal immigration,” said Trump, when I received Conte in the White House on Monday. In this line, the US president also stressed that the Italian Executive “has taken a very firm position on the border, ” something that “many other countries in Europe should do too.” “My Government and the Trump administration are both governments of change, elected by citizens, who want to improve their living conditions,” Conte said, in a conversation that also highlighted the role of Italy in Libya, an Italian ex-colony where this country still has great economic interests that have been subject to diplomatic clashes with France. A mutual self-praise that takes place shortly after the last trips of Steve Bannon, ex-adviser of Trump, to Italy. Bannon, who has been in this country several times this year to meet with powerful groups and has a close collaborator in the country, Thomas Williams, has also met privately with Salvini, according to the Italian press. “I convinced the M5S and the League to ally themselves”, after the Italian elections last March, Bannon declared in an interview. Now the European Union (EU) “will be obliged to agree with Italy,” he said.